Young SVP in the East Region were delighted to receive a grant to assist them with activities from the National Youth Council of Ireland as part of One World Week 2018. “The Sustainable Development Goals (SDGs) relate to every aspect of our lives – poverty, hunger, health, education, climate, peace, equality, sustainability, gender equality, justice and partnerships. Young people around Ireland have taken up the challenge to change the world between now and 2030”. Young SVP was chosen from among a large volume of high quality applications from all over Ireland. The work of Young SVP members at a local level will play a vital role in supporting Ireland to create a better world for current and future generations and in setting Ireland on a path to achieving the SDGs. One World Week is a week of youth-led awareness raising, education and action that takes place throughout Ireland during the third week in November every year. One World Week invites youth groups and young people to think about the issue of Activism and young people – on a personal, local, national, and global level. On the 19th of November the SVP Conference in DIT hosted a workshop for their fellow students “Far & Near: Young SVP Thinking Globally & Acting Locally”. Through the workshop we; developed our understanding of different approaches to development and considered the links between development and the work of Young SVP. We also thought about the power dynamics inherent in representing others in social justice work. Thank you to DIT SVP for hosting the workshop! 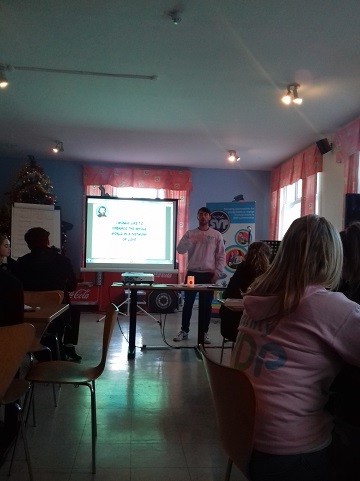 On the 22nd November students and teachers from nine different schools came together in Sunshine House Balbriggan for ‘Young SVP Thinking Globally & Acting Locally’. The Get Together was officially opened by Mary Ita Niall from SVP in North County Dublin, who reminded us of the words of Frederic Ozanam “I would like to embrace the whole world in a network of love”. Next, we heard from Bobby McCormack from Development Perspectives, who explained the background of the SDGs and encouraged us all to be vigilant in recognising our own blind spots. Becca Gallagher, SVP National Youth Development Coordinator, facilitated a session on Poverty in Ireland. After lunch, the students learned how to be peer facilitators and received certificates of achievement. They then returned to their schools to facilitate their own workshops of poverty for their classmates. A highlight of the day was Jack Natin, President of TCD SVP, inspiring us all to take action to make a difference. A big thank you to Jack, Emma, Lara and Conall from TCD SVP for their invaluable support and enthusiasm on the day! Thank you to the students, teachers, SVP members and staff and Bobby from Development Perspectives who supported the day. Thank you also to the NYCI and SVP North County for funding the event and Sunshine House for hosting.